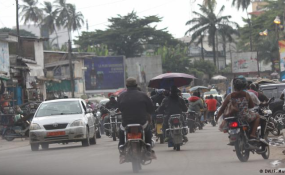 Doula is Cameroon's biggest city and its economic capital. Cameroon is finding it difficult to meet its financial commitments as the battle against armed separatists and corruption depletes the country's resources. In addition to corruption and the battle against separatists fighting to create an English-speaking state, there is also the war against Boko Haram on Cameroon's northern border with Nigeria and the spillover of the crisis in the Central African Republic (CAR). All of these combined are draining the state of its resources. Employees of a company constructing the Paul Biya Stadium in Olembe, on the outskirts of Yaounde, protested against difficult working conditions and non-payment of their salaries. Their spokesperson Dieudonne Nguidjol demanded that they be given a normal contract. "We are supposed to work from 7:30 a.m. to 4:00 p.m. [and] 4:00 p.m. to 6:00 p.m. is supposed to be extra time. Our salaries are not good," said Nguidjol. He added that people who come to work as engineers earn a salary of about 80,000 CFA francs (about €120, $138), which is not in line with Cameroon's labor code. "We have salaries of four, five and six months that have not been paid; this is the immediate cause of this strike," Nguidjol said. Cameroon's Minister of Finance Louis-Paul Motaze said the stadium is just one project that has been affected by the conflicts affecting the country. He said the treasury is stretched with requests for funds for development projects and money to fund the conflicts. "The people want roads. They want security. They want energy. They want agricultural products. We have to realize them with revenues. That means that we have to look for internal revenues. Those internal revenues are taxes. But we have to consider the expenses," Motaze said. The 2019 Africa Cup of Nations (AFCON) project was one of the largest projects recently rocked by a financial scandal in Cameroon. The country was stripped of its hosting right in favor of Egypt due to massive delays in the preparations. Whistleblowers claim that an estimated 1.8 billion euros of Cameroonian public money has been swallowed in contracts shrouded in controversy. A video of a Cameroonian official allegedly defending why a bag of cement costs 15,000 CFA francs for the AFCON project, instead of the normal 4,500 CFA francs, went viral on social media. Ako John Ako, a university lecturer and civil society activist in Cameroon, said that the prices of the 2019 AFCON infrastructure were ten times more than is usual for the same kind of infrastructure in other African nations. "Findings indicated that public contracts suffered one of the highest hits," Ako said. "Within Cameroon, those who implement decisions or grant the order for contracts always have a percentage reserved in their name." Government ministers, heads of parapublic and public as well as giant private enterprises are increasingly being brought down as Cameroon's anti-corruption organ intensifies its efforts. According to the National Anti-Corruption Commission's (CONAC) most recent report, the country saw 375 billion CFA francs returned to its coffers. Despite these efforts, civil society actors like Ako think that CONAC, other anti-corruption agencies and poor governance remain key factors in holding back Cameroon's development. "CONAC and many other agencies that have been created by the state simply come to confirm that Cameroon will solve problems with commissions, but then more often than not most of the commissions created are still a problem and center for corruption within Cameroon," he told DW. Ako went on to say that the Cameroonian government could say that the fight against corruption has been succeeding, because Cameroon does not appear among the first five most corrupt nations in the world. "But corruption still continues to be the venom that is eating and killing the infrastructure and implementation or execution of state activities," he said. The situation in the English-speaking regions, where suspected separatists have been carrying out attacks and kidnappings, is dire. Dominic Asah, one of the supervisors of government development projects, said that up to 20 percent of planned projects could not be implemented due to insecurity and shortage of liquidity. "The socio-political climate in the field is actually what is hampering the execution process in these localities. The northwest region received a total of 490 operations. Only 52 have been executed, 69 are ongoing and 311 are still to take off the ground," Asah said. At least 10,000 workers have quit their jobs in rubber plantations in the English-speaking town of Buea. According to director general Frankline Njie, they require at least 54 million dollars. "None of our rubber estates is operating normally. Some are shut down completely, the workers are threatened," Njie lamented. He said it was difficult for him to understand and accept why all this pain was being inflicted. "The banana sector has been hit. One of our pack houses, where bananas are processed for export was attacked and set ablaze." President Paul Biya has openly called on all fighters to drop their guns and has created a national disarmament commission to socially reintegrate fighters who surrender. Mimi Mefo contributed to this article.